An interview with Allison Scott, mother to 2-time National Champion Jeremy Abbott. She describes what it’s like balancing life, work, and parenting with an elite skater, and how to make lemonade out of life’s lemons. 1 hour, 3 minutes, 35 seconds. On her most embarrassing skating moment: I was skating, and was president of the Aspen Skating Club. I went out on the ice because I was taking ice dancing lessons. I was skating around, watching all the little kids, hit my toepick, split my chin, and ended up in the hospital. The little kids were very upset, there was a lot of blood [laughs]. On her son, Jeremy Abbott, starting skating: With both of my kids being raised in Aspen, in a resort you really need to do these things. So they learned to skate and ski at an early age. So I had Jeremy on the ice at age two. He went out on the ice with a cone. That lasted about two minutes, then he pushed it aside and with his then-stubby legs, he moved around the ice and just took off. So that was really the start of his experience on the ice. And the “I want to do that” statement came when he was four. In Aspen there’s this winter celebration called Winterskol, and they would bring in skating shows as part of that. The year that Jeremy turned four, they brought in Robin Cousins to do the show, as well as Gary Beacom and Cindy Stuart and a few other people. And Jeremy sat on my lap on the ice, and anyone who knows the Aspen Ice Garden knows that it’s one of the coldest rinks around. But at the end of the show, and this is the truth, he turned around and said, I want to do that. So we said okay, and put him in basic skills lessons, and he did his first ice show with the Aspen Skating Club that spring, and did his first basic skills competition that spring as well. On when she realized that Jeremy was good at skating: I don’t know if there’s a great ah-ha moment with those things. I think it becomes a gradual development over the years. During that period, figures were being done. Jeremy at that point was not a huge proponent of figures — in fact, he really hated it [laughs]. And figures at our rink were done very early in the morning, and we did not live close to the rink, so we would drive in or he would be picked up at about 4:30 in the morning. And he was so light that it was very difficult to see the tracings. I once did a seminar on figures with the late Jimmy Disbrow, and Jeremy was demonstrating, and Jimmy got down on his hands and knees and looked and looked and looked, and finally called over another skater to demonstrate because he couldn’t see the tracings [laughs]. I think it took Jeremy six or eight times to pass his first figure test, and then, mercifully, figures went away. Later he took some figures with his former choreographer Tom Dickson and also with the wonderful Janet Lynn, and then he understood what figures were about. But it really was his love for music when you started to see that something was there that kept drawing him back to the rink. It wasn’t really any one thing in particular. On when training started to be intense: He had a wonderful coach up to pre-juvenile, and then his next coach, Peggy Behr, moved to town. He and Peggy hit it off immediately. Peggy had a work ethic, coming from a competitive standpoint, that was a little different, but very nurturing and encouraging. At that point things started to blossom. I wouldn’t call it intense at seven or nine years old, but it definitely changed. The other thing that changed was that in exploring, Jeremy competed in dance, with two different partners, and he competed in pairs as well, with two different partners. That was probably more intense than any kind of freestyle he ever did [laughs]. I really admire people like Meryl [Davis] and Charlie [White] who have been together forever. It’s a marriage, and when you’re asking little kids essentially to get married, with in-laws, it becomes like Meet the Fockers [laughs]. It is very very difficult to have all of these people with all of these agendas be on the same page. And unless that’s where the skaters have decided that’s where to put their effort, it can be a challenge. And it’s a challenge that we finally decided was one that we wanted to continue. And as Jeremy was doing better at the juvenile and intermediate levels, going into novice, it was suggested that he should take a look at what he really wanted to do. And he said, I guess it’s going to be singles. It took a lot of work to get his jumps there, and to have him feel assured enough to do them. And he fractured his back in 2004 learning the triple axel, and he essentially lost the entire season, and it took a while to get over that mental block of being hurt. On moving to Colorado Springs for Jeremy’s skating: When Jeremy finished junior high school, we relocated him down to the Springs, because Peggy said, I’ve taken him as far as I can take him, and he needs more competitive coaching than I can give him. So we moved him to Colorado Springs, and he was living with a host family as he entered high school. His skating improved considerably, but his grades started going in the toilet. At that time, we had Jeremy skating and two kids in college, and we were working three jobs each just to pay the mortgage and tuition, and for Jeremy’s skating which was costing more than the two others combined. So the job at the Broadmoor [Resort] came open, and I applied, and my husband said, whoever gets the job first that pays well enough, we’ll up and move. Which is an incredible commitment, because he had a great job as a radio station manager. So I got the job, we sold our house, and we moved. 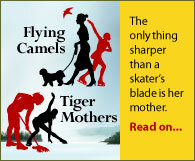 On balancing commitments for each child’s activities: When I become president of the skating club, there was a pretty good understanding that it was going to take away some time [from her daughter’s ski racing], but I would try to balance things as well as I could. Her father was living [nearby], we had been divorced for some time then, and he basically took over the ski racing thing. I think at that point Gwen was okay with it. I was still going to races and I was still traveling with her. It was just on the day-to-day basis, I wasn’t picking her up from school and things like that. I was traveling to competitions with Jeremy more, but she was okay with that. We had a few ups and downs, as you would with any pre-teen, but those were related not so much to skating but more to being a pre-teen [laughs]. But by the time we moved to Colorado Springs, Gwen and Aaron were in college, they were off having their own life. On how much she attended Jeremy’s practices: When I was president or co-president of the Aspen club, ice was very limited. There were only sessions in the morning for patch, and freestyle sessions were twice during the week and then Friday through Sundays. I didn’t spend too much time at the rink other than fundraising, ice shows, and board meetings. I was an ice monitor for some sessions because I skate. But I wasn’t like the intense skating parent sitting there staring at the sessions. That really didn’t happen until we moved here [to Colorado Springs]. Being there was difficult because of my job. I would occasionally go in during lunch, or if I got off work in time I would go for the 5:15 session. And as our well-chronicled changes started to happen, I was at the rink, or my husband was, more than we normally would be. On volunteering in the sport: There wasn’t as much in Aspen because we didn’t have competitions. I started more down here, because of how I feel, how important volunteering is. It’s important for people to understand the workings behind the scenes, and also to know how hard people do work to pull these competitions off. It’s very easy as a parent to roll in with your coach, throw on your kid’s skates, and then sit there and criticize. Criticize the sessions, criticize how many are in there, criticize the judges – until you’ve walked in those shoes to some degree, you don’t really get it. So I say, volunteer, volunteer, volunteer. I was a test announcer for years, and also did monitoring and announcing. I was fortunate enough to get to do announcing for the practice sessions for Skate America and for things like the national synchro event and Four Continents, and also for non-qualifying competitions. You get to know the judges when you do that, and in monitoring you get to know the coaches. You get to know the skaters really well. But no matter what level you volunteer for, you’re going to understand how a competition functions, and they don’t function that much differently from lower levels up through even Worlds or Olympics. There’s a basic structure that’s in place and that’s how it’s run, and once you learn how that happens, then you have a better grasp on how to deal with all of it. On how she deals with “helpful” advice for Jeremy: During the early years, there were really no chat rooms or blogs. There wasn’t a lot of the critical noise out there. And that made it easier, because you were working with your skater and your coach. I have a slightly different philosophy about [unsolicited advice], because almost all the way along the line Jeremy has picked his own music. And he has learned from my husband – Jeremy is an excellent editor, and during high school he was editing music for most of the skaters down here and earning money from it. As he says, he can’t play an instrument to save his life, but he hears music like nobody else that I’ve ever seen. And he can take a long piece of music and edit it into a seamless piece of music to skate to. So it’s been kind of a different situation for us that we had very little music chosen from outside sources. Costuming [laughs], again, I think we’ve been very fortunate to have good costumers, and Jeremy has also had input into his own costumes. Our feeling has been that if you don’t feel the music and you don’t feel comfortable in what you’re wearing, it’s not going to happen if you’re in somebody else’s skin. I really encourage people to let their kids have some input, unless it’s totally off the deep end. And if you don’t know, go to the judges and ask. On on-line chat room criticism: I will say that early on, in the non-qualifying levels, it’s easy to get sucked in and to respond, either under your name or under somebody else’s name, in some of the skating forums that are out there. But in the long run it doesn’t really serve any purpose. And if it’s something that you can’t disassociate yourself from and that you can’t read with a critical eye, then don’t do it. I tend not to go on a lot of the forums. I have seen plenty, some I’ve agreed with, some I’ve disagreed with, and I don’t respond to any of them. Any more [laughs]. And it has been many years since I have. Partly it’s because I’ve become good friends with some of the people who run them, and if they want to know something from me, they’ll call me or send me an email. I don’t feel the need to get on and respond to or to defend my child’s honor, or my honor, or my husband’s honor. I love your [site] and there’s a couple of others I absolutely adore reading, and there are some that would probably fall into the snarky category that I also enjoy reading [laughs]. But I’m able now at this point in our skating career to be able to step back. On the relationship between parents and coaches: I am not a coach, and this is probably the biggest thing that parents need to watch in their behavior. 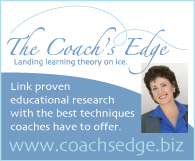 Unless you were trained or you were a skater, you are not a coach and you are not a judge. You are paying an employee to take care of an asset, and that’s your child. You have to trust that the asset is being well taken care of, but you also have to require accountability. There are many ways of doing that, and they don’t have to be confrontational, if some ground rules are set up in advance. You have to view this as a business, and it took me a long time to be able to get to understand this. You are essentially signing a contract with an independent contractor. All the things that you expect really should be outlined in advance. If you’re not doing that, you’re doing yourself, and the coach, and your skater a disservice. You wouldn’t put your child in baseball or football or another sport like that without having some idea of what was expected from the coach. And I don’t know why many of us don’t do that with skating, but we do. I think it has to do with that little gleam in your eye when you see your daughter or son out there performing, and you have all these visions of them going to the Olympics and being the next Tara or Scott or whomever. And I think that really colors your judgement. And you also have people coming up to you session after session, going, oh, Johnny did so great, Lizzie did her backspin, they’re just doing so wonderfully. There’s not always a real assessment of the situation. Plus there’s competition in the rink among parents. That’s a whole another podcast [laughs]. On dealing with other skaters’ parents: We definitely had our share of dealing with other crazy parents, mostly in the partnership situations. Only one was definitely off the deep end. Most of them I would say were okay. There was one dance partnership and one pairs partnership that was off the charts, and of course they didn’t last. Certainly you see it. Personally I had more trouble with parents at the younger ages. When the kids start hitting those higher levels, novice, junior, senior, the parents are a little more laid back. It becomes a different level of communication when you’re sitting in the stands with parents of older skaters. You’re looking at international competitions, you’re looking at assignments, you’re looking at levels with the changes in the judging system. We were trying to learn from each other what we were looking at. On whether she ever wondered why she was doing this: Oddly enough, no. His commitment since literally age four has been so strong and so focused, and I know that sounds really weird to say. But his sister vacillated in her racing career. She would have her ups and downs, she would have her temper tantrums, I don’t want to do this any more, and we’d say you don’t have to do it if you don’t want to do it, and she would go away for a while and come back and find a way to deal with it, because the bottom line was that she really loved it. With Jeremy that never happened. He never wavered from what it was he wanted to do. He never said he wanted to quit, ever. Did he ever say he wanted to change coaches? Yes. Did he ever want to look at changing out of a particular discipline? Yes. Did he ever want to quit skating? No. On Jeremy’s coaching change to Yuka Sato in Michigan: I got a room back [laughs]. It was difficult, but it didn’t stay difficult. When he moved, my husband, Jeremy’s stepdad, packed up his car and drove it cross-country, stuffed to the gills. And once he was there and was settled and I went to see his apartment, I realized that it could not have been more perfect. His apartment was clean, his dishes were put away, which was amazing [laughs]. He went from being a major slob to being something of a neatnik, and he does take great pride in doing all this stuff on his own and paying for the skating all on his own. I think that responsibility made him wake up and grow up a little bit. I miss him terribly, but I wouldn’t want him living back at home again [laughs]. On her blog, Life on the Edge: I graduated with a degree in English, and my mother and father were both journalists. I felt that I needed to share, whether anybody read it or not, and I wrote it for me. I wanted to chronicle for me what this experience has been. And along the way I’ve been able to hit a nerve with other people who read it, and I’m grateful for that. But I wanted to share some of the pitfalls and a lot of the joys of being a parent growing up in the sport. And I choose those words wisely, because it’s not about the kid growing up in the sport, it’s about you growing up in the sport. And I wanted to be able to remember all those things. On her blog post, after Jeremy’s short program at the 2010 Olympics, about making lemonade out of lemons: When your kid goes out on the ice for the first time, and you go through this thing for the first time about what do you want to do with your skating, everybody goes, oh, I want to go to the Olympics. And everyone goes, aw, that’s so cute. And then as you actually start to move toward that, and the stress of getting there, and then finally getting there, it is overwhelming. It shouldn’t be, but it is. When you get there and everything that you have done hinges on either two minutes and 40 seconds, or four minutes and 50 seconds, that’s pretty big stuff. And what is important to remember is to put it back in perspective as quickly as possible. It is an important moment, but it’s a moment. And it’s what you choose to make out of that moment that will carry you out of that time frame. How you choose to use it to your advantage is what makes the rest of your lifetime, not what happened in that short period of time. So that’s about stepping back and looking at an experience, and not letting it consume you. On the Olympic experience: [The media focus on Evan Lysacek and Johnny Weir] allowed Jeremy to focus on what he needed to do. But a lot of that had to do with Yuka. A lot of it had to do with setting a time frame after Nationals, saying, you’re a two-time national champion, you’re going to the Olympics, we have work to do, so you go do the Today show, you do these things, and after those are done, that’s it. Local TV and a Japanese TV crew were allowed into the rink to do their filming, but it wasn’t disruptive. Yuka said, you have a job, this is a job, you do those appearances, and then we’re going to focus on the two weeks you have to get your stuff together. But Jeremy had a very interesting statement after what, in his mind, was a less than stellar Olympics. He said, I focused on the wrong thing. Going into Nationals, I was focusing just on having two good skates and making that team I’ve been dreaming about for so long. He said, when I got to the Olympics, my focus was wrong. I was focusing on a medal. I should have been focusing on having two good skates. And that’s a big lesson to learn. Hard to learn at the Olympics, but if you learn it, you learn it. That kind of brings you back to focus on what you need to do. Being raised in the media, [the focus on Weir and Lysacek] didn’t bother me all that much. And it bothered my daughter more than it bothered Jeremy. And the bottom line is, that’s all that matters. He was fine being where he was because he was getting comfortable in his own skin. He said that when he won his first national championships he felt like it was a little bit of a fluke, and that this time when he won he was out to really do the best performances he could. And he did, and he started to get it. He felt the same way when he won the Grand Prix. He was kind of like the accidental tourist [laughs] because it’s taken him a while to find his persona and his voice, and he has that voice now and he’s comfortable with it. Now he can choose how he wants to present himself, and the things that matter most to him. It’s not about walking the runway or whatever. For him it’s still about the sport. On whether, like Amy Hughes, she couldn’t bear to watch her child perform in the Olympics: I watched it live, I had no choice [laughs]. I learned a long time ago that I have no control over what happens on the ice, so I might as well watch. And of course at the Olympics I happened to be sitting with the executive director and the president of US Figure Skating, so that made it a little difficult, particularly in the short. But I watch, and people say, well, how was it to go to the Olympics, and I joke about it a little bit and say that except for two minutes and 40 seconds it was the greatest experience of our lives. And that’s really true. And even that two minutes and 40 seconds was a bump in the road. Being there, being involved, and I can’t tell you how wonderfully you’re treated as parents, and seeing our friends from Aspen who were there, who had kids in other sports, in snowboarding mostly, some in cross-country, sharing that experience was phenomenal. Can I watch? Of course I can watch. I go back and watch now, because it kind of reinforces the whole experience, good and bad. And the bad was not bad. Bad was sad because my son was sad. It wasn’t the end of the world. On her involvement with Jeremy’s connections with his fans: I monitor pretty much everything. With the job I have here, I am in charge of all our social media, which is pretty widely spread for a place as big as the one I work. I’m probably the oldest Facebook stalker on the planet [laughs]. I run seven pages on Facebook, so I’m on there quite a bit. On Jeremy’s fan page there are five of us that are webmasters. We believe in transparency, so if you see a WM or a little “pigs can fly” symbol, that’s one of us posting — it’s not just me. And we try to keep people informed and engaged, because that’s what social media is about. If you sit on a page and nothing is being posted and you’re not reacting and answering questions, you’re doing the people who care a disservice. Jeremy goes on the page, he posts, he answers questions. He likes Twitter, and he does a lot of IMing with his friends. He’s probably on it more than we are, because he has so many different places where he can communicate. We watch his back, and we make sure that things are appropriate, because it’s a PG page. We try not to “nuke” people off unless it’s really appropriate, and we’ve only fortunately had a couple of times when we had to do that. What we’ve found is that the people who gravitate to Jeremy as his fans, they get it. They understand what he’s about, and they understand that what he does, he has a great passion for. And they have a great passion for it. They get loud [laughs]. They know that not everything is going to be perfect every time, but they also know that it’s not for lack of trying. One of the most difficult things to get people to understand, and we have several family members who fall into this category, is that skating is still a sport. And even when you’re performing it in a show, ice is slippery, blades can be not sharpened, boots can not be what they should be, lights can be funky, ice can be funky, and you can just simply be tired. But you still have to put it out there. And a fall or trip is not the end of the world – it’s just something that can happen when you do things night after night after night on ice. And his fans get that. And I think we’re all very appreciative of that.